Gallery 1 in the Douglas Hyde can be a large space, a mini-Barbican nestled in the basement of Trinity. It takes a certain type of photographer and a certain type of work to fill the walls and not get lost within the space. 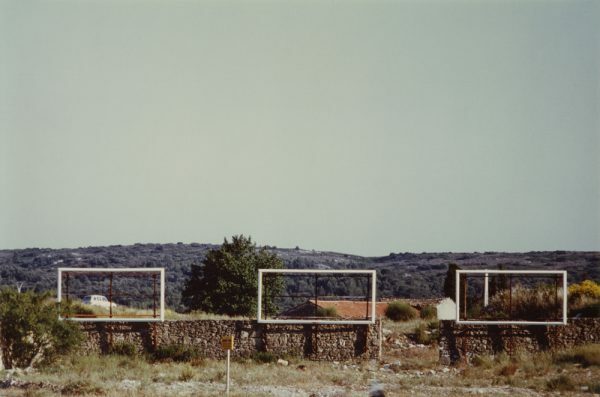 It is a testament to Luigi Ghirri that not only do his images, the majority of which are no bigger than postcards, fill the space but they positively burst off the walls. Kodachrome, the late Italian’s self published first book, features heavily in this retrospective of his career. Regarded as his magnum opus and a pioneering series in the history of colour photography, few photographers can claim such a rich tapestry to call upon. Ghirri was always respected and highly regarded during his lifetime, he passed way in 1992, but his standing and recognition has been on a continuous rise in recent years. Since the turn of the decade his work has twice featured in the Venice Biennale, MACK Books reprinted Kodachrome to mark the 20th anniversary of his death and features have come in Frieze and the New York Times among others publications. This careful and meticulous curation has been driven by his daughter Adele and cared out faithfully by the Matthew Marks Gallery. Ghirri excelled at making the unremarkable remarkable and pouring emotion into seemingly banal scenes. His images hold a drama that sits almost uncomfortable within the frame trying to burst out. The show runs until the end of September and this Thursday at 5pm sees the screening of La Grande Belezza (The Great Beauty) by Ghirri’s fellow countryman Paolo Sorrentino.